Did you know that a poorly maintained air conditioner needs to work twice as hard to make your home feel cool in summer? To keep your air conditioner in peak condition (and keep those pesky electricity bills down), it’s worth following these super simple tips on maintaining your air conditioner. Your indoor air conditioner has air filters that need regular cleaning. The more clogged your filter is, the harder your air conditioner will need to work to push air through it. If left uncleaned, a significant volume of dust can accumulate on top of and inside your air conditioner filters. This build-up can eventually clog your air conditioner, reduce its air flow, diminish its performance and result in higher running costs. Most indoor air conditioners typically have one or two main filters. Your air conditioner may also have an air purification filter that can be removed and cleaned; this type of filter will eventually need to be replaced once every two years. Cleaning your air conditioner is easy. Simply pop open the plastic cover and remove the filter, or multiple filters. Take these filters outside and give them a shake. For a thorough clean, use a brush with gentle bristles or vacuum the filter with your vacuum cleaner’s dusting brush head. If your filters are extremely dirty, we recommend giving them a gentle wash in a sink filled with warm water and a mild detergent. Rinse them clean with fresh water and ensure they are completely dry before placing them back inside the air conditioner. How often should I clean the inside of my air conditioner? Aim to clean your air filter at least four (4) times a year, in anticipation of summer and periods of heavy use. The more often you use your air conditioner, the more often you should clean its filters. Just like you need to keep the inside of your air conditioner clean, if your air conditioner has an outdoor unit (i.e. if you have a split system air conditioner), you should keep your outdoor compressor unit free from debris that can obstruct its performance. Debris can build up on your outdoor compressor unit’s cooling fins, limiting its airflow. Ultimately, this can mean your compressor will need to work harder to achieve the same result, leading to increased energy use and higher costs. How often should I clean the outside of my air conditioner? To clean your outdoor air conditioning unit, we recommend checking it once every few months to clear away dust, leaves and cobwebs from its cooling fins. We recommend installing your outdoor air conditioning unit in a place where you can keep it relatively clear of falling debris for easier long-term maintenance. 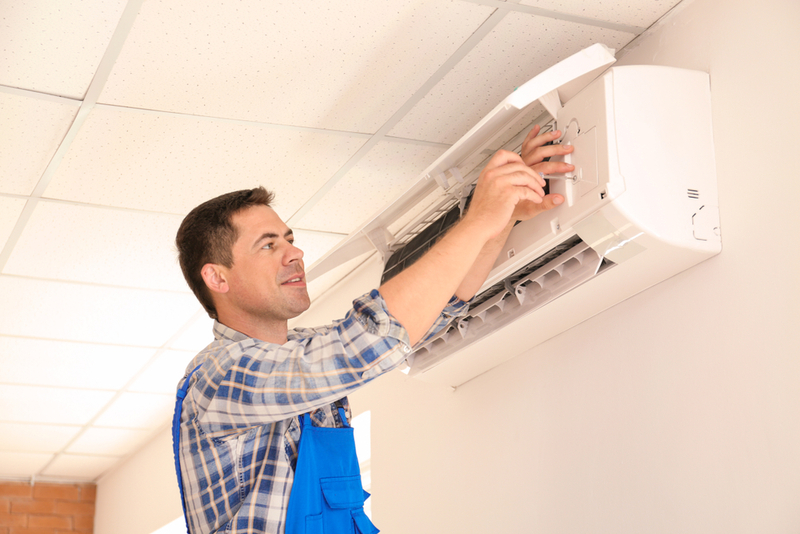 No matter how astutely your clean your air conditioner with these methods, at some point you will need to have a licensed air conditioning technician perform a service on your air conditioner. Why? A professional air conditioning technician knows exactly what to look for, can spot potential issues, and fix any problems that you may or may not notice. What will your air conditioning technician do during this service? First, they will check the refrigerant gas levels. Next, they will test your thermostat. Finally, they will ensure all of the air conditioner’s internal parts that help it work effectively are in good working order. How often should I organise an air conditioning service? A professional service should be arranged once every year. This will make sure your air conditioner continues to work smoothly and efficiently throughout its lifespan. To keep your air conditioner in good condition, it’s important to avoid unnecessarily overworking your air conditioner. We recommend seeking an air conditioner that comes with inbuilt programmers and features to improve its energy efficiency. How can I reduce my air conditioner’s energy output? On especially hot days, you can help reduce pressure on your air conditioner by starting your air conditioner before the day reaches the zenith of its heat. Many modern air conditioners also have a human sensor feature that automatically switches the air conditioner to energy saving mode if no movement is detected in the room for 20 minutes. Although it can be tempting on a sweltering day, don’t set your air conditioner’s temperature too low. Instead, pick the ideal temperature for your climate. What is the ideal air conditioning temperature for southeast Queensland? If you live in Southeast Queensland, the best temperature to set your air conditioner in summer is 25 degrees Celsius. If you have a reverse cycle conditioner, set the temperature to 18 degrees Celsius in winter. This will ensure a comfortable environment while reducing your energy consumption — keeping your air conditioner stress-free and saving you money in the process. Keeping your air conditioner well-maintained not only means making sure it’s clean and working correctly. It means taking steps to reduce unnecessary strain on your air conditioning unit, so that it can continue to work for you and your family for many years to come. To keep your air conditioner in top working condition, you need to have it regularly serviced. Get in touch with H&H Air Conditioning today on (07) 3276 1800 (Brisbane) or (07) 5477 1777 (Sunshine Coast).